1. 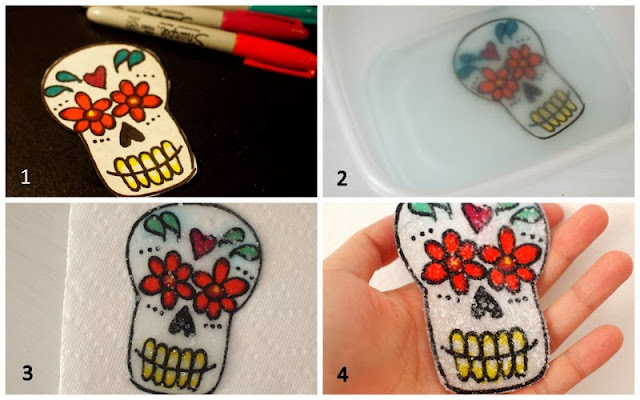 Draw your design on a piece of contact paper. 2. Cut your cellophane into little rectangles. 3. Peel off the back of your contact paper. Tape your contact paper to your working area (sticky side up.) Then, stick on your cellophane rectangles. 4. When you're satisfied with your design, place another piece of contact paper (sticky side down) on top of your design. Then, trim around your skull. Tada! This is a super fast way to grow crystals on kids' artwork. I love this craft because it's a nice mixture of art and science. 2. Boil your water. Pour it into your empty container. (You don't need very much. You just need enough to cover your ornament.) Then, dissolve and mix in spoonfuls of Borax one at a time until the Borax no longer dissolves. Place your paper ornament onto the bottom of the container. 3. Wait a couple of hours and you should see crystals forming on your ornament. Pull it out and make sure your hole is still open. If it isn't, just poke it open with a pencil. Dry the ornament on a paper towel. 4. Initially your ornament will feel soft, but once it dries it will become stiff and hard. String your ribbon through it and and enjoy.